When deciding on carbon or bi-metal bandsaw blades, cost is an issue, and change is another. Here are some pointers about both types of bandsaw blade and a few of the models carried here at SawBlade.com. It is hopeful that this information will help in making the right choice. Carbon bandsaw blades are general-purpose saw blades ideal for use in small maintenance shops and for light-production cuts. They are made of tough alloys with high silicon content and have precision milled, heat-treated teeth and a flexible back. A versatile blade for all types of wood, non-ferrous metals, and mild steel using less than 200′ per minute blade speed. 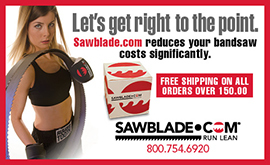 SawBlade.com offers two types of carbon blades. The low-cost 101 Series of flex-back Carbon blade is recommended for plastics, soft woods, and nonferrous applications. The 201 Series hard-back Carbon blade has greater rigidity than the flex-back and is recommended for hard woods and mild steels like aluminum, brass, and plastics, allowing for up to 25 % higher cutting pressure performance. The cost-effective change from carbon to bi-metal blades is not that substantial. Each saw blade in production has its own unique qualities and are designed to conform with specific materials or work load. The saw blade needed for these specific jobs should depend on the materials being cut and not as a cost-saving measure. Bi-Metal bandsaw blades are used to handle everything from simple metal cutting to production cutting of super alloys. SawBlade.com offers four types of bi-metal blade. The 601 series Haltbar M42 can cut metal up to 45 Hrc. This is considered to be a general-purpose saw blade since the 601 series will cut a variety of materials to include die and mold steels, stainless steel, nickel based alloys, and non-ferrous alloys. Our 501 Series Haltbar IC is ideal for cutting bundles and structural shapes. It has 8 % Cobalt high-speed steel teeth that can cut materials up to 69 Hrc. The 701 series Haltbar M42 HP can cut exotics and nickel-based alloys, high-hardness steels, and other solids like Inconel, D2, stainless steel, and Monel. Finally, we have the 901 series Haltbar M42 Pallet Dismantler. This particular bandsaw blade is manufactured specifically for the disassembling of wood pallets. The 901 range was designed and developed with the input of those who disassemble pallets and is proven to be effective in nail snag resistance. Our application designed tooth geometries outlast the competition, and the special tooth set assures that nails are cut with a minimum of kerf loss. It would be cost-effective to change from Carbon to Bi-Metal bandsaw blades if the types of materials being cut in production require the use of one blade over the other: materials exclusive to the Bi-Metal saw blade. If a carbon saw blade is used to try cutting steel or alloys, the teeth are going to strip. It makes sense, then, to switch to a bi-metal saw blade and avoid having to continuously replace broken and stripped carbon blades when a bi-metal blade will do the work properly. The best possible solution if cost-cutting and time-saving measures are the eventual goal for any machine shop. This entry was posted in All Posts and tagged #bandsaws, Bandsaw, Bi-Metal, blades, Carbon, sawblade.com. Bookmark the permalink.